In the interest of our children and all future generations, in the interest of the survival of the human race we must all become a part of the solution and stop being part of the problem. It is now time for us to think for ourselves and make our own decisions, because we cannot afford to follow the blind and the ignorant any longer. We must think for ourselves and act accordingly. You see it is now time for us, the people of this country, to take a long, critical look at ourselves and this society in which we live in. I think it is now necessary for me to point out a few cold hard facts that may assist you in identifying some needs for change, thus supporting my statement that we must make changes to improve this society in which we live. 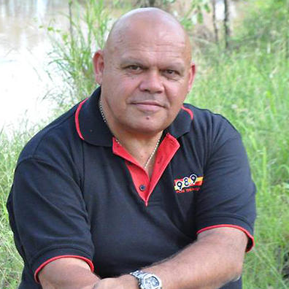 Tiga Bayles was an Australian radio presenter and indigenous rights activist. A Birri Gubba Gungalu man and a Dawson River Murri, Bayles was raised in Theodore, Queensland. Bayles helped establish the Brisbane Indigenous Media Association (BIMA) which operated the radio station 98.9 FM (Brisbane). Bayles hosted the program Let's Talk which discussed issues relevant to First Nations people. He was the inaugural winner of the national Deadly Award for Indigenous Broadcaster of the Year In 1982, he was involved with the Aboriginal movement protests around the 1982 Commonwealth Games. Tiga was an early chairman of the NSW Aboriginal Land Council, and named Queensland Father of the Year in 2005. His work around decolonisation and invasion was recognised by Amnesty International’s inaugural media awards in 2014. Tiga was deeply involved in the renowned Murri School in Brisbane’s Acacia Ridge, and served as its Chairman for many years, a role he held until his passing in 2016.